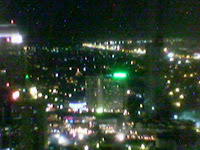 I missed the city lights at night and some skyscrapers visible in my workstation when we were still in PBCom. Truthfully, my workstation has the best location here in our office in Mckinley. That's what Ryan told me yesterday when he asked us if we are okay with our respective places (his a help desk associate from CAI main office in Allentown, PA). I totally agree with him since I'm located way at the back, far from people bustling around. Not to mention far from the eyes of people who can see what I'm doing here in my PC (like blogging for example). I'll post some pics of our new office next time.